When half his inheritance is left to his aunt's housekeeper, English orphan Rosie Clifton, Spanish aristocrat Don Xavier Del Rio is determined to claim what's rightfully his. So when Rosie surprises him with a marriage proposal, Xavier sees a way to get everything he wants…including Rosie in his bed! 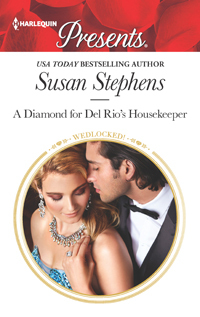 Rosie will do anything to protect her home on the Isla Del Rey—even marry Xavier! She'll provide him with an heir, in exchange for him leaving the untouched beauty of the island intact. But can she trust her charming new husband—or his devastating kiss? © 2014-2018 Susan Stephens, Inc. All rights reserved. Site by Glass Slipper WebDesign.